Two goals by Stephen McGladrigan and another by Gary Giffin gave Vale victory over Whitletts in their final match before Saturday’s Scottish last 16 tie with Ayrshire giants Hurlford. Rossvale were looking to mark boss Gordon Moffat’s 50th game in charge in style - and it took them just eight minutes to go in front against a young Whitletts side. A neat bit of play from captain Jamie Hunter down the left set up David Leadbetter to play the ball into the danger area. He in turn found McGladrigan who, with one touch, turned in the box and fired a low shot into the net to the keeper’s right. Whitletts got back into the game after steadying themselves with a fine move down the left hand side and a cross fired into the Vale box but the ball was knocked wide. At the other end McGladrigan was again causing issues for the visitors and made space in the box after a neat ball into his feet by Kirk Forbes. But this time his shot was saved by the Whitletts keeper. However the Vale striker did find the target again in the 33rd minute to double Vale’s lead. A long diagonal ball by Liam McGonigle found Giffin on the right and his run and pass into the area set up McGladrigan who made no mistake, clipping the ball past the oncoming keeper to put Vale 2-0 up. There were two more decent chances before half- time for Rossvale to add to their advantage. The first fell again to McGladrigan who fired into the side netting in the 40th minute. And two minutes later Forbes created space for a shot on goal but his low effort shot landed in the keeper’s hands. After the break Whitletts came out determined to get back into the game and created two very good chances in the opening 10 minutes. But on both occasions they found Rossvale keeper Jamie Donnelly in their way to stop any danger. However the Ayrshire side did pull a goal back in the 62nd minute, courtesy of former Rossvale player Adam Forsyth who broke into the box and coolly slotted a right footed shot past Donnelly. Shortly afterwards Vics had a chance to equalise but Donnelly was on hand to parry the shot to safety. But Rossvale sealed victory with a third goal 14 minutes from time. McGonigle picked the ball up on the right inside his own half and ran at the visitors’ defence, beating two of them before sliding perfect ball through for Giffin to latch onto, round the keeper and slot home to make the points safe. The win move sup Rossvale up to fifth place in the table, but with at least three games in hand over all the sides above them. 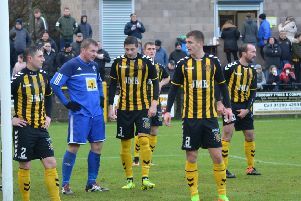 However the bid for promotion goes on hold this week as the Bishopbriggs side host last season’s beaten Scottish Junior Cup finalists Hurlford hoping to make the quarter-finals of the competition for the first time in their history. Kick-off at Huntershill is 1.45.